The 2011 Chickasaw Silver Bullion Coins are the final of five America the Beautiful Silver Bullion Coins® released in 2011 by the United States Mint. The coins, which honor Chickasaw National Recreation Area in the state of Oklahoma, also mark the tenth issue in the fifty-six coin series which debuted in 2010 and runs until 2021. Struck with identical imagery as found on the circulating America the Beautiful Quarters®, these silver coins at three inches in diameter and a weight of five ounces will be much larger than any other product from the United States Mint. The only exception to that is the associated America the Beautiful Five Ounce Uncirculated Coins™ which feature these same designs and are also struck with a three inch diameter. The United States Mint released the Chickasaw Bullion Coins on July 18, 2011. According to the Mint, an initial mintage cap of 126,700 was in place for the strikes. Chickasaw Silver Bullion Coins, or any in the series for that matter, are not 90% silver coins like pre-1965 U.S. coinage or modern commemoratives. Instead, the five ounces are of pure 99.9% fine silver. As such, the silver coins will always have an intrinsic melt value based on those five ounces of silver in each piece. For example, if silver is currently trading at $10 an ounce, each would have an approximate melt value of $50. As a bullion product of the U.S. Mint, they will not be sold directly to the public. The Mint uses a network of authorized purchasers to distribute its bullion coins. That network obtains them in bulk from the Mint, then resells them for a small premium above the current market value of the precious metal contained within them. As such, their prices will always be higher than the current silver spot price. Collectors will also have an interest in them for their numismatic values. Those coins in excellent condition — and especially those graded by third parties as such — will enjoy premiums typically far above melt values. Additionally, demand and availability will play a factor in Chickasaw Silver Bullion Coin values. 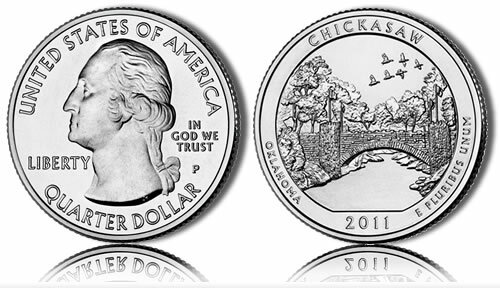 As mentioned, the Chickasaw Silver Bullion Coins honor the Chickasaw National Recreation Area which is found in the state of Oklahoma. This site was originally established on July 1, 1902, as the Sulphur Springs Reservation from 640 acres of land purchased from the Chickasaw Indian Nation, for which the recreation area now takes its name. The Indians were forcibly relocated to the area from the Southeastern United States in the 1830’s. Congress redesignated Sulphur Springs as Platt National Park on June 29, 1906, only to be combined with Arbuckle Recreation Area and redesignated to its current name and status of Chickasaw National Recreation Area on March 17, 1976. Today the area consists of almost 10,000 acres and sees well over 1 million annual visitors who are not required to pay an entry owing to an agreement made with the Chickasaw Nation when the land was first purchased. The obverse of each Chickasaw Silver Bullion Coin contains a portrait of George Washington, the first President of the Untied States. His image was designed by John Flanagan and is on all the bullion coins, as well as quarter-dollars since 1932 — to include all the new quarters. The reverse of the coin contains the design emblematic of Chickasaw. This includes a depiction of the Lincoln Bridge and surrounding area found within the recreation area. The design was completed by Donna Weaver and sculpted by Jim Licaretz. Sales of coins in this series can be tracked on the sales figures page. Current melt values can also be found there for the coins based on the most recent market prices.